Although concepts in constitutional law do not often manifest themselves in the everyday practice of law, a basic understanding of the foundation on which our entire legal system is built is vital to a student's legal education. This course will provide our students with a general understanding of the major issues in constitutional law, including the separation of powers between the executive, legislative and judicial branches of the federal government; federalism and states’ rights, the concept of interstate commerce; freedom of speech (the First Amendment); substantive and procedural due process; and the equal protection clause; various areas of discrimination. Perhaps the portions of the Constitution most relevant to the everyday practice of law are those sections of the Bill of Rights which deal with criminal procedure and litigation. Therefore, this course will especially focus on the rights of a criminal defendant. The areas to be highlighted on will include: the Fourth Amendment’s protection against unreasonable searches and seizures by the police; the Fifth and Fourteenth Amendments’ guarantees of “due process” for an alleged criminal; the Sixth Amendment’s guarantee of the right to counsel along with the landmark case of Miranda v. Arizona; and the Eighth Amendment’s prohibition of cruel and unusual punishment. Articulate the roles of the federal, state and local governments. Explain the concept of separation of powers. 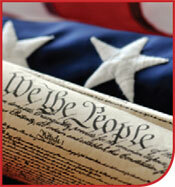 Determine whether a particular state or federal law is at risk of being found unconstitutional. Describe the due process and equal protection clauses of the U.S. Constitution and their impact on civil rights. Articulate the standards the courts use in determining whether the government may make classifications that treat people differently from one another. Describe when a law can deprive people of certain freedoms. Research case law involving claims of government deprivation of civil rights. Determine whether a claim of government deprivation of civil rights is likely to succeed, based on the applicable case law. Describe the freedoms protected by the First Amendment, such as, speech, assembly and religion. Articulate the standards the courts use in determining whether, and in what manner, government agents may restrict freedoms. Describe and apply the rights and responsibilities of police officers under the Fourth and Fourteenth Amendments, regarding search and seizure. Differentiate between "searches" that are regulated by the Fourth Amendment and police actions that are not considered searches and are thus not restricted by the Amendment. Determine whether a particular search illustrated in a fact pattern is proper under the Fourth Amendment. Analyze whether the "fruits of an illegal search" will be admissible in a particular case, based on the governing case law. Describe the process by which a criminal suspect is arrested, held, interrogated and eventually tried. Describe the protections afforded a criminal suspect in police custody. Determine whether a particular statement made by a defendant is admissible in court. Determine whether a suspect is considered to be in "custody" when he made the statement. Determine whether the suspect was properly "Mirandized." Determine whether a statement given by a suspect was in response to an "interrogation" and the ramifications thereto. Describe the rights of a criminal suspect through the trial and sentencing process.